A lack of businesses scaling-up is hampering UK productivity – there remains a need to stimulate a greater volume of scale-up businesses and SME exporters to counteract the UK’s lagging productivity. OECD data shows that Britain is near the bottom of the table for the percentage of businesses that grow to more than 10 employees after three years. A need to delivery further diversity in the small business finance market – there is an ongoing need to accelerate the evolution of a diverse and accessible range of finance options to drive competition and choice for smaller businesses. The four largest banks still account for 80% of the small business loan market in 2014, with many small businesses not looking at alternative finance options beyond their main bank. Supporting growing SMEs across all UK regions – the finance landscape remains uneven across the UK. To help rebalance growth, an increased availability of finance for smaller businesses across the UK is required. 71% of total SME equity investment is accounted for by London and South East based companies. This survey, undertaken by BMG Research for the British Business Bank, follows on from the previous 2012 and 2014 “SME Journey” surveys to explore SME awareness of different types of external finance and their experience of raising finance. 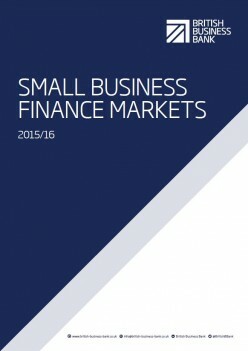 We have extensively used the findings from this survey within our new Small Business Finance Markets 2015/16 report to assess how finance markets have changed. Amongst the findings, this survey shows a continued increase in business awareness of alternative finance types, including peer-to-peer lending and crowdfunding. The research also shows that a higher proportion of SMEs are aiming to grow in the next 12 months (56%), compared to 46% in the previous 2014 survey. This survey, undertaken by BMG Research for the British Business Bank, assesses the characteristics of mid-caps (businesses with £25m-£500m annual turnover) and their experience of raising external finance. The survey finds that mid-cap businesses are more likely to use and seek external finance compared to SMEs, and are also more likely to obtain finance. In addition, a high proportion of mid-cap businesses (79%) are aiming to grow in the next 12 months. The British Business Bank would like to consult with interested stakeholders on appropriate methodologies for assessing the unmet demand for SME debt finance. The consultation seeks views on our proposed methodology and suggestions for alternative methodologies or additional data sources.